A good friend was fond of saying that human beings were created to live in a garden. That sentiment has always stuck with me. When I first heard him say it, it was one of those moments when one realizes a basic truth, which had been there all along but remained hidden for some reason. In the Jewish and Christian traditions, at the beginning, The Creator called the heavens and the earth into being and set about separating the darkness and chaos from light and divine order. Then came the plants, and animals. By the end of the first week, The Creator made man in the form of Adam from the dust of the ground to be the guardian and steward over Creation. Although it was late on Friday of the first week when Adam showed up, The Creator was able to wrap everything up by the weekend and declared that it was all very good. There was harmony and balance in a perfect system that was fruitful and self sustaining. Then The Creator took a break. On Sunday of week 2, The Creator planted a garden He named Eden, which means “delight” and “garden of God”. Norman Maclean said, “Eventually all things merge into one, and a river runs through it.” And in Eden it did. By now, Eve showed up and everything was set. The scriptures mention God walking through the garden in the cool of the evening, delighting Himself in the Creation and the company of Adam and Eve. The scriptures tell of the prophet Elijah being sent by God to “Go out, and stand on the mountain before the Lord.” (1 Kings 19:11). There was wind, an earthquake and a fire. And then a small voice; a whisper asking “What are you doing here?” The voice of God was in the stillness. While we were held in awe at the sight of Creation on this day, my companion said to me that this must have been how The Creator introduced Adam to his new home. Perhaps He said something like, “See all I have created before you. I made it for my pleasure and I want you to take care of it for me. I will meet you here and we will walk together and talk”. I think Wendell was right. The Creator is delighted to be among His creation and to be in the company of human beings. He made a garden just so He could take quiet walks with us and He invited us to live there. The world we created for ourselves is full of noise and distractions. Alas, the Garden of God was closed to us long before we started keeping track of such things. Maybe it’s right in our back yard and we never thought of it before. 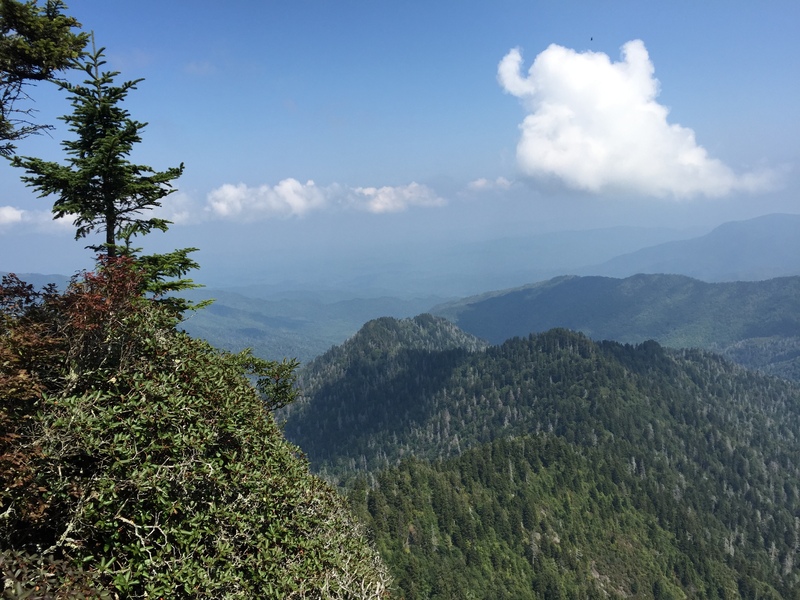 This entry was posted in Encounter Creation and tagged Appalachian Trail, Charlie's Bunion, Great Smoky Mountain National Park, Norman Maclean, The Jump Off on September 7, 2015 by blogginggazelle.